A rock-cut tomb is a burial chamber that is cut into an existing, naturally occurring rock formation, so a type of rock-cut architecture. They are usually cut into a cliff or sloping rock face, but may go down from fairly flat ground. It was a common form of burial for the wealthy in ancient times in several parts of the world. Important examples are found in Egypt, most notably in the town of Deir el-Medina (Seet Maat), located between the Valley of the Kings and the Valley of the Queens. Other notable clusters include numerous rock-cut tombs in modern Israel, at Naghsh-e Rostam necropolis in Iran, at Myra in Turkey, Petra in modern Jordan, Mada'in Saleh in Saudi Arabia, Sicily (Pantalica) and Larnaca. Indian rock-cut architecture is very extensive, but does not feature tombs. Egyptian rock-cut tombs (1450 BCE, Thebes, Egypt). Phrygian rock-cut tombs such as the Midas monument (700 BCE). Etruscan rock-cut tombs, Etruria, Italy (500 BCE). Tomb of Darius I (Naqsh-e Rostam (480 BCE). Lycian rock-cut tombs (4th century BCE). 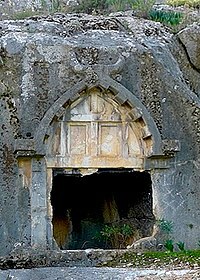 A kokh (plural: kokhim, Hebrew: כּוּךְ‎) is a type of tomb complex characterized by a series of long narrow shafts, in which the deceased were placed for burial, radiating from a central chamber. These tomb complexes were generally carved into a rock face, and were usually closed with a stone slab and had channels cut into the centre of the shaft to drain any water that seeped through the rock. A kokhim complex survives at the far west end of the Church of the Holy Sepulchre in Jerusalem. The Church wall runs through the centre of the complex, and the remaining two thirds no longer exist. Many more kokhim can be found throughout the Judean foothills. A reconstruction of Sahneh rock cut tomb, near Kermanshah, Iran, Achaemenid Period. By Mazdak Shervin, 2018. ^ Hadjisavvas, Sophocles (2012). The Phoenician Period Necropolis of Kition, Volume I. Shelby White and Leon Levy Program for Archaeological Publications. p. 1. Archived from the original on 2016-03-04. ^ a b c d e f Ching, Francis D. K.; Jarzombek, Mark M.; Prakash, Vikramaditya (2010). A Global History of Architecture. John Wiley & Sons. ISBN 9781118007396. ^ Roller, Lynn E. (1999). In Search of God the Mother: The Cult of Anatolian Cybele. University of California Press. pp. 84–110. ISBN 9780520919686.